In a time where so many dead tree magazines are ceasing publication and transitioning exclusively to online editions, it is remarkable to see not one, but two journals going the other way. Shortly before Christmas, Dublin historical blog Come Here to Me released an eponymously-titled hard-back collection of posts by Sam McGrath, Donal Fallon and Ciarán Murray from their blog, expanded, updated and accompanied by new material, copies of which are now harder to find than Kerry County Councillor who is willing to say drink driving is a bad thing. Allegedly it is still available in Books Upstairs and Chapters, though I say allegedly because I bought the very last copy in The Gutter Bookshop back on December 17th, and I find it hard to believe that they lasted any longer elsewhere. A second printing is on its way, and judging by the reaction my grandfather had to it (wherein he proceeded to read out a new bit of trivia from it every five minutes for the rest of Christmas night after I gave it to him), it should make anyone with even a passing interest in the city we laughingly call home a most welcome gift. Just make sure to keep a copy for yourself. This evening I returned home to find the postman had delivered the second of our reverse medianauts. 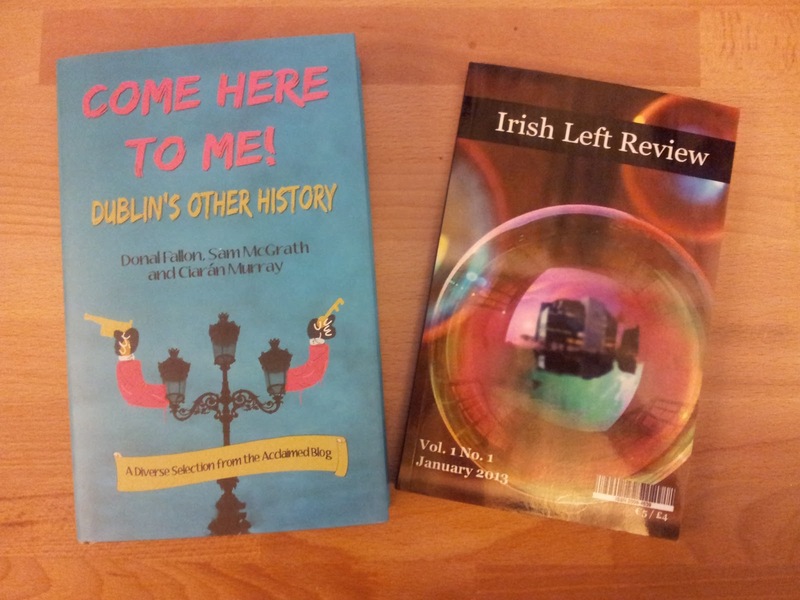 Irish Left Review is an online political magazine, with contributions from the broad left that tend more towards the academic than the polemic. After a good few years now of a purely digital existence, they have taken the bold plunge into the Really Real World of actual print journals, and released the first of what will hopefully be a long run of dead tree editions that look equally at home on your coffee table as on an empty beer keg in your local anarchist vegan squat. This first issue focuses on the Irish Financial sector and how it clasps the grasping tendrils of global capitalism tight to its chest, with pieces by Conor McCabe, Mark Malone, Donagh Brennan and William Wall and an interview with tax expert Richard Murphy, all woven together with poetry and prose by Dave Lordan, Sarah Clancy and Sean Bonny. You can buy the journal online, but for an authentic 1990's experience just like your parents used to enjoy, you should take a wander in to Connolly Books and hand over a fist full of coppers and then read it on the bus home while trying to make sure the cute girl across from you can see the title. She'll think you are ever so mysterious and well-read. Honestly. Well done to everyone at ILR and Come Here to Me, more of this sort of thing please!